The El Paso Regional Communications Center is home to the City of El Paso’s Police, Fire, and 311 Dispatch, as well as the El Paso County Sheriff’s Office Communications Division, City/County office of Emergency Management, Emergency Operations Center, and Fusio & Watch Centers. We are a regional center sharing Hexagon’s Intergraph CAD & Mobile Suite, and 911 Vesta phone resources with 38 different law enforcement and fire/ems agencies. 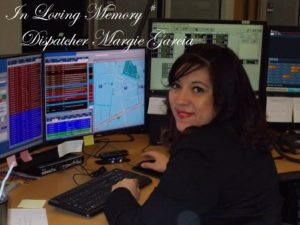 This week we celebrate not only National Telecommunicator’s Week, but also the life of Police Dispatcher Margie Garcia whom we tragically lost on April 13th 2019 as the result of a motor vehicle accident. Margie served the El Paso Community for 22 years! Forever in our hearts! We are 911… When Seconds Count!